Once again the time has come for the battle (Prelims). And who else than your best companion in the last preparatory phase for UPSC IAS Prelims 2019 i.e 60 days plan. Hope the message given above makes sense to you all. The productive utilization of this programme demands consistency, honesty, faith and strong determination to be in the process of learning and unlearning. You might not be fully prepared to solve all the questions but the learning and unlearning through these questions will prepare you for the real battle on 2nd June 2019. You have to unlearn your repetitive mistakes, gut feeling on which you mark doubtful questions. You have to learn new things and also those concepts that you were very sure of but somehow because of traps in the option, got it wrong. You have to learn ‘how to convert knowledge into marks’ (Because most of the times, after ending the exam, you regret making mistakes in known concepts). Secondly, keep a long distance from following too many things at this point. It will always backfire. Once you are here, put complete faith and follow this initiative along with whatever you were doing. It is very important to consolidate your preparation with many revisions. Simply following many things will leave you in despair. You can cross check this with veterans. Everything that seems attractive is not productive. You should always go for productivity. Be wise! Let us pledge to make it a big game changer (better than last year) in the next 60 days of this plan! Last year, aspirants used to type/post their answers in the comment box on a daily basis. There were huge participation and discussion below the test post. Putting answers in the comment box has been very effective to self-track yourself after updating the score. In the end, you can cross check your performance through Disqus profile. It was highly effective in the last edition of 60 Days that propelled aspirants to monitor their performance and learn through discussion. Let you solve these questions with full honesty and write your result in the comment box. Interact with peers to know your mistakes. The importance of this initiative stands time-bound and aggressive reverse engineering to learn the concepts. Many of you must be busy with your own strategy but let us tell you honestly that in the last few months, it is very important to revise and consolidate your learning. Just reading won’t suffice. So, take out a few hours from your schedule and make it a revision exercise. How can you make the best use of it? Be honest to your effort and do not start competing with XYZ aspirants just for the sake of marks. It is more important for you to introspect and check your learning than focusing on others. Try to answer the questions in 25 minutes only. Do not get into negative feeling that I don’t have enough knowledge to answer these questions. Feel like you are taking the real exam. What would be your response then? You can copy paste the same format/modify as per your need in Google Spreadsheet and update it on daily basis. Feedback talks about daily test results. Follow-up talks about daily target achieved from sources and the number of revisions to do/done and dates. Sources column is to ensure that aspirants do not run behind various sources and follow the same throughout. The following Test is based on the syllabus of 60 Days Plan-2019 for UPSC IAS Prelims 2019. If soil contains greater proportion of big particles it is called sandy soil. If the proportion of fine particles is relatively higher, then it is called loamy soil. If the amount of large and fine particles is about the same, then the soil is called clayey. If the proportion of fine particles is relatively higher, then it is called clayey soil. If the amount of large and fine particles is about the same, then the soil is called loamy. Sandy soils have little air but they are heavy as they hold more water than the clay soils. The best topsoil for growing plants is Loamy soil is a mixture of sand, clay and another type of soil particle known as silt. Silt occurs as a deposit in river beds and it particles size is larger than those of sand and clay. The loamy soil has humus in it and has the right water holding capacity for the growth of plants. Which of the above statements are incorrect? Note: Incorrect options have been asked. Clay soils have little air but they are heavy as they hold more water than the sandy soils. Silt occurs as a deposit in river beds and it particles size is between those of sand and clay. Clayey and loamy soils are both suitable for growing cereals like tea and coffee as these soils can’t retain water. For lentils (masoor) and other pulses, soils rich in clay and organic matter and having a good capacity to retain water are ideal. For paddy (rice) loamy soils, which drain water easily, are required. For cotton, sandy loam or loam, which drain water easily and can hold plenty of air, are more suitable. Clayey and loamy soils are both suitable for growing cereals like wheat, and gram. Such soils are good at retaining water. For paddy, soils rich in clay and organic matter and having a good capacity to retain water are ideal. For lentils (masoor) and other pulses, loamy soils, which drain water easily, are required. The A-horizon is generally dark in colour as it is rich in humus and minerals. The C-horizon is generally harder and more compact. The uppermost horizon is generally dark in colour as it is rich in humus and minerals. The humus makes the soil fertile and provides nutrients to growing plants. This layer is generally soft, porous and can retain more water. It is called the topsoil or the A-horizon. The next layer has a lesser amount of humus but more of minerals. This layer is generally harder and more compact and is called the B-horizon or the middle layer. The third layer is the C-horizon, which is made up of small lumps of rocks with cracks. In most of the cases, the parent material determines the colouration, mineral composition and texture of the soil. The rocks from which soils are formed are called parent materials. The soil formed is always having the same physical properties of the parent rock. In some cases, the soil formed may or may not have the same physical properties of the parent rock. Climatic factors induce chemical changes which also affect physical properties of the soil. The surface rocks are exposed to the process of weathering. In this process, the rocks are converted into fine grains and provide a base for the soil formation. These rocks are also sedimentary in nature and they are much older. On weathering they give rise to comparatively more mature soils. The soil is more or less of uniform character but of high fertility. Gondwana rocks are sedimentary in nature and they are much younger. On weathering they give rise to comparatively less mature soils. The soil is more or less of uniform character but of low fertility. Volcanic outburst over a vast area of the Peninsular India many hundred million years ago gave rise to Deccan Traps. Basaltic lava flowed out of fissures covering a vast area of about ten lakh sq km. The weathering of these rocks has given rise to soils of darker colour. The soil is fertile with high moisture holding capacity and is popularly known as ‘regur’ or black cotton soil. Basalts are rich in titanium, magnetite, aluminium and magnesium. Consequently the weathering of these rocks has given rise to soils of darker colour. Red soils along with its minor groups form the largest soil group of India. They are basic mainly due to the nature of the parent rocks. The alkali content is fair. They are fairly rich in phosphorus and potassium. The main parent rocks are crystalline and metamorphic rocks like acid granites, gneisses and quartzites. The texture of these soils can vary from sand to clay, the majority being loams. On the uplands, the red soils are poor, gravelly, and porous. But in the lower areas they are rich, deep dark and fertile. They are acidic mainly due to the nature of the parent rocks. The alkali content is fair. They are poor in lime, magnesia, phosphates, nitrogen and humus. They are fairly rich in potash and potassium. Laterite soils are mostly the end products of weathering. They are formed under conditions of low temperature and heavy rainfall with alternate wet and dry periods. Laterite soil rich in oxides of iron and aluminium compounds and Silica . Laterite soils are red in colour due to little clay and more gravel of red sand-stones. They are formed under conditions of high temperature and heavy rainfall with alternate wet and dry periods. Heavy rainfall promotes leaching (nutrients gets washed away by water) of soil whereby lime and silica are leached away and a soil rich in oxides of iron and aluminium compounds is left behind. ‘Laterite’ means brick in Latin. They harden greatly on loosing moisture. These soils occupy about 15 percent of the total land area of India. The north facing slopes of Himalaya are very steep and exposed to denudation and hence do not support soil formation. They are suitable for plantations of tea, coffee, spices and tropical fruits in peninsular forest region. Wheat, maize, barley and temperate fruits are grown in the Himalayan forest region. Mountain soils occupy 8.67% of the total land area of India. They are mainly heterogeneous soils found on the hill slopes covered by forests. The formation of these soils is mainly governed by the characteristic deposition of organic matter derived from forests and their character changes with parent rocks, ground-configuration and climate. In the Himalayan region, such soils are mainly found in valleys, less steep and north facing slopes. The south facing slopes are very steep and exposed to denudation and hence do not support soil formation. Forest soils occur in Western and Eastern Ghats also. The forest soils are very rich in humus. They are deficient in potash, phosphorus and lime. They require good deal of fertilizers for high yields. They are suitable for plantations of tea, coffee, spices and tropical fruits in peninsular forest region. Wheat, maize, barley and temperate fruits are grown in the Himalayan forest region. These are soils with large amount of organic matter and considerable amount of soluble salts. It is called kari in Kottayam and Alappuzha districts of Kerala. They are black, heavy and highly acidic. They are deficient in potash and phosphate. The most humid regions have this type of soil. They are black, heavy and highly acidic. Kottayam and Alappuzha districts of Kerala where it is called kari. Also occur in the coastal areas of Odisha and Tamil Nadu, Sunderbans of West Bengal, in Bihar and Almora district of Uttarakhand. Crops of Peaty – Marshy Soils: Most of the peaty soils are under water during the rainy season but as soon the rains cease, they are put under paddy cultivation. Indian soils are largely deficient in nitrogen, mineral salts, but they are rich in humus and other organic materials. Indian soils have been used for cultivation for hundreds of years and have lost much of their fertility. Most soils are old and mature. Soils of the peninsular plateau are much older than the soils of the great northern plain. Indian soils are largely deficient in nitrogen, mineral salts, humus and other organic materials. Plains and valleys have thick layers of soils while hilly and plateau areas depict thin soil cover. Some soils like alluvial and black soils are fertile while some other soils such as laterite, desert and alkaline soils lack in fertility and do not yield good harvest. Indian soils have been used for cultivation for hundreds of years and have lost much of their fertility. Wasteland, over exploitation of soils due to increase in population and rise in living standards and encroachment of agricultural land due to urban and transport development. Which of the above statements are problems with Indian soils? Salinity and alkalinity (excessively irrigated regions of Punjab, Haryana, Karnataka etc.) 6. Wasteland, over exploitation of soils due to increase in population and rise in living standards and encroachment of agricultural land due to urban and transport development. The proportion of nitrogen is generally low with proportion of Potash, phosphoric acid and alkalies being adequate. They are the largest soil group covering about 76 per cent of the total area. They support more than 40% of the India’s population by providing the most productive agricultural lands. The soil is porous because of its loamy (equal proportion of sand and clay) nature. Alluvial soils are the largest soil group covering about 46 per cent of the total area. They are immature and have weak profiles due to their recent origin. Most of the soil is Sandy and clayey soils are not uncommon. Pebbly and gravelly soils are rare. Kankar (calcareous concretions) beds are present in some regions along the river terraces. The soil is porous because of its loamy (equal proportion of sand and clay) nature. Porosity and texture provide good drainage and other conditions favorable for agriculture. These soils are constantly replenished by the recurrent floods. The proportion of nitrogen is generally low. The proportion of Potash, phosphoric acid and alkalies are adequate The proportion of Iron oxide and lime vary within a wide range. Some alluvial soils are found in the Narmada, Tapi valleys and Northern parts of Gujarat. Crops in Alluvial Soils They are mostly flat and regular soils and are best suited for agriculture. They are best suited to irrigation and respond well to canal and well/tube-well irrigation. They yield splendid crops of rice, wheat, sugarcane, tobacco, cotton, jute, maize, oilseeds, vegetables and fruits. Geologically, the alluvium of the Great plain of India is divided into newer or younger khadar and older bhangar soils. The bhabar belt is about 8-16 km wide running along the Shiwalik foothills. It is a porous, northern most stretch of Indo-Gangetic plain. Rivers descending from the Himalayas deposit their load along the foothills in the form of alluvial fans. These alluvial fans (often pebbly soils) have merged together to build up the bhabar belt. The porosity of bhabar is the most unique feature. The porosity is due to deposition of huge number of pebbles and rock debris across the alluvial fans. The streams disappear once they reach the bhabar region because of this porosity. Therefore, the area is marked by dry river courses except in the rainy season. The area is not suitable for agriculture and only big trees with large roots thrive in this belt. Terai is an ill-drained, damp (marshy) and thickly forested narrow tract (15-30 km wide) to the south of Bhabar running parallel to it. The underground streams of the Bhabar belt re-emerge in this belt. It is a swampy lowland with silty soils. The terai soils are rich in nitrogen and organic matter but are deficient in phosphate. These soils are generally covered by tall grasses and forests but are suitable for a number of crops such as wheat, rice, sugarcane, jute etc.. This thickly forested region provides shelter to a variety of wild life. The Bhangar is the older alluvium along the river beds forming terraces higher than the flood plain (about 30 metres above the flood level). It is of a more clayey composition and is generally dark colored. A few metres below the terrace of the bhangar are beds of lime nodules known as “Kankar”. The Khadar is composed of newer alluvium and forms the flood plains along the river banks. The banks are flooded almost every year and a new layer of alluvium is deposited with every flood. This makes them the most fertile soils of Ganges. They are sandy clays and loams, more dry and leached, less calcareous and carbonaceous (less kankary). A new layer of alluvium is deposited by river flood almost every year. It is a soil group typical to the dry and hot regions of the Peninsula. In general, black soils of uplands are of low fertility while those in the valleys are very fertile. The black colour is due to the presence of a small proportion of titaniferous magnetite or iron and black constituents of the parent rock. This soil is ideal for Rice and sugarcane irrespective of water availability. These soils are best suited for cotton crop. Hence these soils are called as regur and black cotton soils. Other major crops grown on the black soils include wheat, jowar, linseed, virginia tobacco, castor, sunflower and millets. Rice and sugarcane are equally important where irrigation facilities are available. Large varieties of vegetables and fruits are also successfully grown on the black soils. This soil has been used for growing a variety of crops for centuries without adding fertilizers and manures, with little or no evidence of exhaustion. Shale refers to a sedimentary rock resulted from compaction process of small old rocks containing mud and minerals – such as quartz and calcite, trapped beneath the earth surface. The shale gas is the natural gas trapped within these shale rocks. It is one of the unconventional types of natural gas along with coal bed methane, tight sandstones, and methane hydrates. All statements are self explanatory. Under this technique a vertical well is drilled to the targeted rock formation and then at the desired depth, the drill bit is turned horizontally, exposing the well to more of the producing shale. In this technique, water along with chemicals and sand are pumped into the well and a fracture or crack is developed in the shale rock to release the hydrocarbons trapped in shale formations to flow from the shale into the well. Hydraulic fracturing when used in conjunction with horizontal drilling, it enables gas producers to extract shale gas at reasonable cost and rapidly as it enhances the flow of gas quickly to the desired well. Jambusar located near Vadodara in Gujarat is India’s first shale gas exploratory successfully drilled in Cambay region. To strengthen its hydrocarbon resource base, India has identified six basins as areas for shale gas exploration: Cambay (Gujarat), Assam-Arakan (North East), Gondwana (Central India), Krishna Godavari onshore (East Coast), Cauvery onshore, and Indo-Gangetic basins. Shale gas is an unconventional source of energy found in highly porous rocks with low permeability. In addition to shale gas, India has got reserves of other unconventional natural gases like Coal Bed Methane, Coal Mine Methane, and Tight Gas which are in the different stages of development/production. Shale gas is found in LOW POROSITY but HIGH PERMEABILITY rock formations. Porosity is a measure of how much of a rock is open space. This space can be between grains or within cracks or cavities of the rock. Permeability is a measure of the ease with which a fluid (water in this case) can move through a porous rock. The CBM is extracted from virgin coal mines. At present CBM is produced from four blocks – Jharia in Jharkhand, Raniganj East and South in West Bengal and Sohagpur West in Madhya Pradesh. At present Coal Mine Methane is not trapped and is blown out of coal mines. Tight Gas reservoirs in Eocene formations in Gujarat and Northeast India have been discovered. No commercial discovery of shale gas reserves has been made in India so far. All the statements are self explanatory. Coal Bed Methane or CBM refers to methane that is found in coal seams. It is formed during the process of coalification, the transformation of plant material into coal. CBM is also known as virgin coal seam methane or coal seam gas. It is widely considered an “unconventional” source of natural gas. Coal Mine Methane or CMM refers to methane released from the coal and surrounding rock strata due to mining activities. In underground mines, it can create an explosive hazard to coal miners, so it is removed through ventilation systems. In abandoned mines and surface mines, methane might also escape to the atmosphere through natural fissures or other diffuse sources. Like CBM, CMM is a subset of the methane found in coal seams, but it refers specifically to the methane found within mining areas (e.g., within a mining plan), while CBM refers to methane in coal seams that will never be mined. Because CMM would be released through mining activities, recovering and using CMM is considered emissions avoidance. Ventilation air methane (also known as VAM) refers to the very dilute methane that is released from underground mine ventilation shafts. VAM represents more than half of all coal mining emissions in the United States and worldwide. With few exceptions, it is simply released to the atmosphere. The high volumetric flowrate and low concentrations of VAM (i.e., less than 1 percent) make it challenging to capture and utilize cost-effectively. It is technically possible, however, to convert the dilute methane in ventilation air to useful energy and the economic feasibility of these projects are currently being developed, demonstrated, and commercialized. Tight gas refers to natural gas reservoirs locked in extraordinarily impermeable, hard rock, making the underground formation extremely “tight.” Tight gas can also be trapped in sandstone or limestone formations that are atypically impermeable or nonporous, also known as tight sand. In other words, the pores in the rock formation in which the gas is trapped are either irregularly distributed or badly connected with overly narrow capillaries, lessening permeability — or the ability of the gas to travel through the rock. When gas molecules are trapped in a lattice of water molecules at temperatures above 0°C and pressures above one atmosphere, they can form a stable solid. These solids are gas hydrates. Most gas hydrates are formed from methane (CH4). Methane is the simplest hydrocarbon, and is the primary component of the natural gas that we burn for energy. Gas hydrate deposits along ocean margins are estimated to exceed known petroleum reserves by about a factor of three. These hydrate beds leak gases into the water, forming cold seeps on the ocean floor. This hydrocarbon seepage is common on continental margins around the world. Most seeps are also characterized by high microbial productivity. ONGC has been an active participant in the National Gas Hydrate Programes (NGHPs). To promote this a Gas Hydrate Research & Technology Centre (GHRTC) was established at Panvel. The gas hydrate programme by India began in 1997. ONGC has struck gas hydrate reserves in the deep sea off the Andhra Pradesh coast. The reserves are located in the Krishna-Godavari basin, which came into the limelight about a decade ago. The fresh reserves are estimated to be around 134 trillion cubic feet (tcf), about one-third of the gas reserves of the United States, which is the largest producer of natural gas in the world. The Karma Kagyu school belongs to the Vajrayana branch of Mahayana Buddhism. It conceives itself as a member of the third turning of the dharmacakra and participates in the Rimé movement. The fruition of the path, which is beyond any contrived acts of meditation. The supreme lama of the Karma Kagyu is the Karmapa, who always presides as lineage holder once he has reached his majority and received all the necessary training and dharma transmissions. ‘Hiawatha Glacier’ was seen in news recently. Where is it located? Hiawatha Glacier is a glacier in northwest Greenland, near Inglefield Land. Hiawatha Glacier attracted attention in 2018 because of the discovery of a crater beneath the surface of the ice sheet in the area. It is launched to study the earth’s surface in the visible, near infrared and shortwave infrared regions of the electromagnetic spectrum. HysIS is an earth observation satellite developed by ISRO. It is the primary satellite of the PSLV-C43 mission. The satellite will be placed in 636 km polar sun synchronous orbit (SSO) with an inclination of 97.957 deg. The primary goal of HysIS is to study the earth’s surface in visible, near infrared and shortwave infrared regions of the electromagnetic spectrum. The Jenkins’s shrew (Crocidura jenkinsi) is a critically endangered species of mammal in the family Soricidae. It is endemic to South Andaman Island. The Council will submit its report to the Prime Minister every six months. The total reserves with the RBI stand at Rs 9.6 lakh crore, up from Rs 8.38 lakh crore in F17. The RBI reserves are divided under several heads. It holds contingency fund worth Rs 2.32 lakh crore, up from Rs 2.28 lakh crore in FY17. Under currency and gold revaluation account, the RBI holds Rs 6.92 lakh crore, up from 5.3 lakh crore in FY17. It has 0.23 lakh crore under asset development fund, same as in FY17. Under investment revaluation account for rupee, it holds Rs 0.13 lakh crore, down from Rs 0.57 lakh crore in FY17. More than 50 per cent of rural habitations and 85 per cent of Government schools and anganwadis have been provided with access to safe drinking water. More than 40 per cent of rural population has been provided potable drinking water by piped water supply. More than 30 per cent of rural households have been provided with household connections. 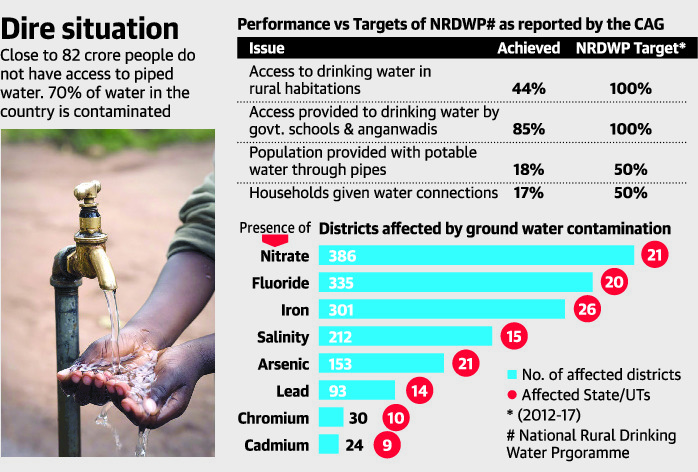 NRDWP is a centrally sponsored scheme aimed at providing every person in rural India with “adequate, safe water” for drinking, cooking and other domestic basic needs in a “sustainable manner”. National Rural Drinking Water Programme (NRDWP) was launched in 2009. By 2017, NRDWP aimed to achieve certain objectives. However, by December 2017, these objectives were not completely attained. It aimed to provide all rural habitations, government schools, and anganwadis access to safe drinking water. Of this, only 44% of rural households and 85% of government schools and anganwadis were provided access. It also aimed to provide 50% of rural population potable drinking water (55 litres per capita per day) by piped water supply. Of this, only 18% of rural population was provided potable drinking water. It also sought to give household connections to 35% of rural households. Of this, only 17% of rural households were given household connections. India Skills Report is a joint initiative of Wheebox, a Global Talent Assessment Company, PeopleStrong, a leading HR Tech Company and Confederation of Indian Industry (CII). Stated that Employability continues to rise thus reaching a new high of 47% this year – An incremental change of almost 2-3 percentage points since last year and a huge change of over 15% points in the past 5 years. Jute crop requires humid climate with temperature fluctuating between 25 degree Celsius and 30 degree Celsius. Minimum rainfall required for jute cultivation is 100 mm. Minimum rainfall required for jute cultivation is 1000 mm. New grey alluvial soil of good depth receiving silt from annual floods is most suitable for jute growth. However, jute is grown widely in sandy looms and clay loams. PH range between 4.8 to 5.8 (acidic) is best suited for its cultivation. In news: The CCEA approved that 100% of the food grains and 20% of the sugar shall be mandatorily packed in diversified jute bags. The decision to pack sugar in diversified jute bags will give an impetus to the diversification of the jute industry. INDRA-2018 military exercise between India and Russia was conducted here.